How did you manage the puzzle pieces? Okay let me guess, Illustrator. 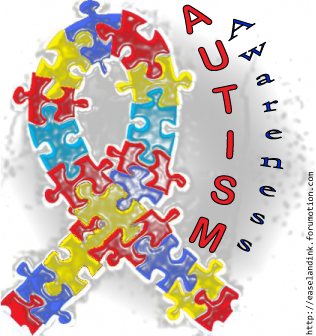 MashaAllah at last some Autism ribbon graphics - I got stuck on how to paint the jigsaw design to represent Autism. Yes sis zaza, I did use Illustrator for this. There is a brush which has a jigsaw design mashaAllah, although not the same colour as what's required, so I apply the colour in a different program like Paint for example. Mashallah dear sis Mabsoota, these are really nice and the puzzle is perfect. How can we not recognise who make them the blinkies are signed. Lol sis Khadija, not too difficult to figure out, it has Aisha written all over it, if you know what I mean! I've seen one of the bottom two before but never the first one, which is my absolute fav! Lovely work Aisha.